But should they? The median wealth figure – $98,000 – isn’t a lot of money for a boomer with a long spell of retirement ahead of them. Boomers who leave the labor force often put themselves at risk of depleting their 401(k) assets too soon. Butrica’s research clearly indicates that women’s increasing labor force participation has benefitted husbands. Married men’s assets increased 44 percent, suggesting that a career wife can’t hurt when saving money. 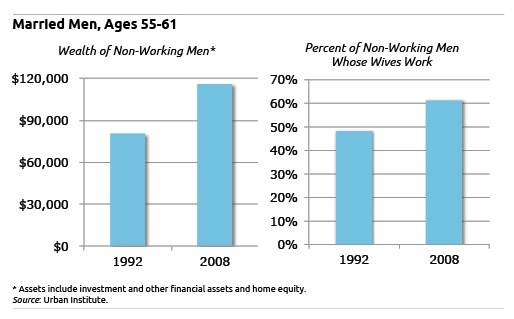 In 1992, 48 percent of married, non-working men had working wives but 61 percent do today. Men receiving health insurance through their wives don’t have to stay at a full-time job just for the benefits. “If you have (other) income coming in, then maybe there’s less pressure” to work, Butrica said. In contrast to men, the percent of married, non-working women whose husbands work declined slightly. By 2010, in the wake of the financial-market collapse, assets had declined slightly for single men and women and dramatically for married men; but married women’s assets were actually higher in 2010 than in 2008. In one indication that many of these non-workers left the labor force voluntarily prior to 2008, a relatively small share collected unemployment benefits during the early months in the recession. On the other hand, the percent of income for non-working boomers that comes from disability and Social Security has risen for men and women, married and single, though that also includes benefits for widows, caregivers and others. The picture of non-workers nearing retirement historically has never been rosy: one-third are poor, according to the Urban Institute study, published by the Center for Retirement Research (which sponsors this blog). People in their late 50s also find themselves out of the labor force due to health problems or layoffs, and they are more likely to be minorities and to lack high school or college degrees. But some may leave the workforce to change their careers or pursue entrepreneurship – or improve their golf game. Those with defined benefit pensions from past employers may be able to support themselves until they claim Social Security. Even among non-workers who receive little or no income from alternative sources such as disability or a pension, the share falling in the top 20 percent of assets increased over time. Financial and other assets also are increasingly a source of income for non-workers, who typically rely on such programs as Social Security Disability Income, defined benefit pensions, or private disability coverage or other government transfers. Today, more of them derive income from businesses, rental properties, and interest and dividends: 38 percent of single male non-earners, for example, reported receiving income from investments, up from 18 percent in 1992.